This is another word thrown into sentences uselessly in two ways similar to “available”. “These regulations are applicable to…” No, no, and again no. It’s much clearer to say “These regulations apply to…”. “Please fill in the applicable forms.” Hold on…why fill in only the applicable ones? Why not also fill in the inapplicable ones? Again, there is no reason to specify “applicable”, because those are the only forms anybody would fill in. Words like ‘applicable’ are useless. Throw them away! Most of the time, we use this word as an extra exclamation mark. For instance, “I was very upset.” In what way is this different than “I was upset”? If what you mean to say is “I was fuming,” say it. As for “very”…throw it away! As useful as it can be in some cases, we throw “that” into sentences that really don’t need the word. We wish that there was more time to play. I saw that there was a need for my services. They knew that they were the best team. Each of these sentences reads better without the “that”. Throw it away! People throw this word into a sentence to say that what they are saying is true. Sometimes, they use it to contrast with an imagined truth. For instance., “I thought that they were angels, but in reality, they were aliens.” Hat tip to Styx. In such cases, there might be a reason to use “in reality”. Even so, read that sentence again without “in reality”. The more succinct sentence still works, so it’s your choice. Other times, people throw “in reality” into a sentence where there is no contrast with the imagination. In those cases, it is just underbrush blocking the reader’s path. Throw it away! And the word “really”, do we really need it? I mean, do we need it? Some people throw the word into sentences, but nobody can really explain why. In fact, nobody can explain why. Do we really need “really”? Throw it away! These words get thrown into so many sentences. There is such a simple test for this. Read the sentence without these words to see if it makes sense. It always does. Unless you are comparing the essence of something to its non-essence, the word has no use. And when was the last time you did that? Throw it away! “I began to take some interest” can just as easily be said as “I began to take interest”. “I ate fruit for breakfast” is more to the point than “I ate some fruit for breakfast”. “Some” adds no meaning, because it means an unspecified quantity. The “some” is implied by simply not specifying the quantity. No need to include the “some”. Throw it away! Most of the students quiet down when the teacher enters the room. Most students quiet down when the teacher enters the room. “Of the” is often not needed. Throw it away! “This particular word is often not needed. In fact, this word is not needed. Two sentences. Same meaning. It’s not a particularly useful word. Throw it away! Component means part. Writing “component part” makes as much sense as writing “fabric cloth” or “location place”. So stick with “part” on its own: one syllable in one word, instead of four syllables on two words. Throw it away! Marks were higher this year on the exams conducted. Since the exam would not be an exam without being conducted, no need to specify that it was conducted. It’s not an experiment until it is conducted. Throw it away! We successfully completed the installation. They successfully hired more bakers. The surgeon successfully transplanted his brain. If it had not been successfully completed, it had not been completed. No need to say it was successfully completed. As for the brain… Throw it away! Remember that when you write, people have to read. 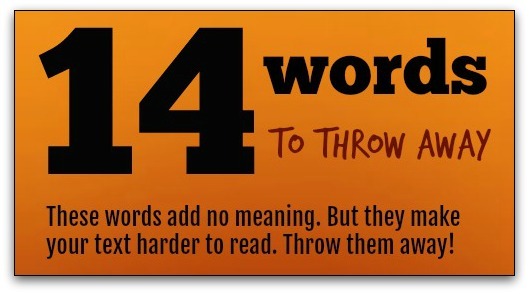 Don’t torture them with useless words they have to skip over. Else, they might choose to stop reading, and then you’ve wasted your time writing. Remove the useless words from your reader’s path. Throw them away! You forgot the bane of an editor’s existence: “Nowadays” and “in this day and age”. Yuch. Great information, David. I actually come by your site because I see you on most of the sites I’ve visited. So I came over to read your post. In fact, I use some of these words in my posts. Now I know better. “Very” is the classic one people say not to use. Some people say not to ever use adverbs, either. Excellent David. Need to pass this onto the young ‘uns! I would add the word “Just.” 9 times out of ten it is useless. Find a sentence with it, say it without it, and you will understand that the word is usually not JUSTified. This is really a great alert to the people like me. Good to note these useless!!! words. I use to use some of them, and now I realize the seriousness! Thanks, Dave, this is really useful to all writers and readers. Thanks again for this wonderful shout out.